The principles for traversing are much the same as for front-pointing up steep ice. However, because you're moving to the side instead of straight up, it's more difficult to keep one foot perpendicular to the ice as you replace the front points of the other foot. 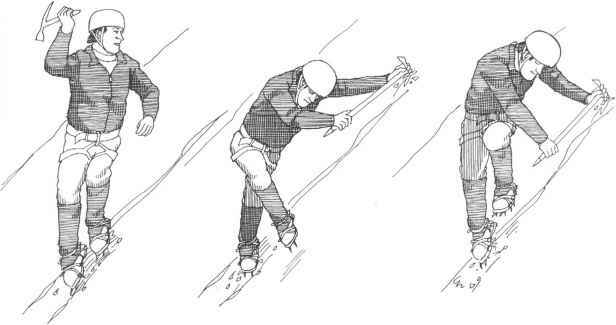 If the heel rotates, the front points will also rotate and come out of the ice. Hand tools also tend to rotate out in sideways travel. Start from a secure position—feet on the same level, with front points and hand tools in place (fig. 14-30). Replant the leading tool in the ice at about a 45-degrcc angle from your body. This puts it lower than if you were ascending, but not so far to the side that it causes your body to rotate out from the wall as soon as you remove the trailing tool. With the leading tool in place, you can shuffle sideways on front points. You also have the option of making a two-step move, crossing the trailing foot over the leading foot, and then bringing the other foot back into the lead. Most climbers prefer the shuffle, which is less awkward and feels more secure. After moving your feet, replant the trailing tool closer to your body. In good ice, the trailing tool can often be securely planted in a hole left by the leading tool—especially if the first tool leaves a small hole that can serve as a starter for a larger-nosed second tool.